Hi, my name is Bill Fraser and I’m the head coach of the Comox Valley area’s premier MMA and fitness training academy. First off, a big congratulations on taking the first step towards feeling and looking better than ever before through the use of our mixed martial arts training system. Comox Valley Martial Arts is home of a welcome positive and fun atmosphere made up of people from all walks of life. 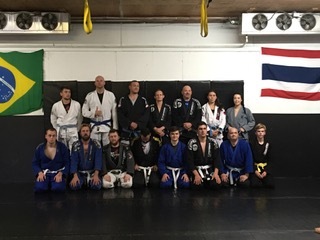 Doesn’t matter if you are a MMA competitor, fitness enthusiast or someone looking to build their knowledge in the martial arts, we will help you reach your goals and promise you will have a great time doing it. We’ve made getting started free and easy – all you need to do is fill out the form at the bottom of the page to register for “quick start program” plus all of the free bonuses that go with it. What makes the Academy special? Our clean, safe, and family-friendly environment. All of our Comox Valley Mixed Martial Arts programs are run in a family friendly team orientated atmosphere. No bad attitudes or goons to worry about here. Smart injury-free training is what we are all about. Giving you the most out of your time here and a chance to continually progress as a martial artist without having to worry about getting hurt, burnt out or bored with training.